Hibernian manager Pat Fenlon admitted, after his side fought back from 2-0 down to earn a draw with Championship new boys Huddersfield Town, that his squad lacks depth. “We’re a little short in areas and need to bring in a few more to support the players we do have,” said the Irishman. That much was clear, particularly at the back, where the same mistakes which proved costly last season were still being made, at least in the early stages of Saturday’s encounter. However, new recruit Paul Cairney, who arrived at Easter Road as a free agent after seeing out his contract with Partick Thistle, believes there are bargains to be had if Fenlon chooses to look at other players from the First Division. Pointing out that Huddersfield won promotion from League One with a trio of signings from that very league (Scott Arfield and Kallum Higginbotham from Falkirk and Callum Woods from Dunfermline), Cairney would be only too willing to make a few suggestions should Fenlon seek his advice. Cairney made his home debut as a second-half substitute and he hopes that there will be no repeat of the relegation battle which could have wrecked his chances of playing in the top flight. 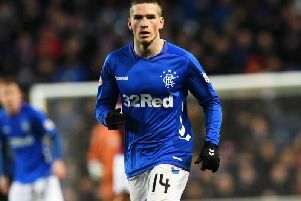 “It was a shock to see Hibs down near the bottom last season, so when I knew they were interested in me I was hoping they’d stay up,” he said. “They shouldn’t be down there at the bottom of the league because of the size of club, the fans and the gaffer. Cairney did have other options when his contract with Thistle expired, but he was persuaded that his career would be best served by a move to Easter Road. “[Thistle manager] Jackie McNamara and also my agent, Darren Jackson, were pushing for me to come here,” he said. “They have a Hibs connection and they’ve also played for big clubs in Scotland. So I listened to their advice and, hopefully, I can do well. I like to go forward and I’d like to think I can get a few goals this year. The manager’s just told me to keep working hard and I’ll do that. “We’re ready for the new season, especially with the players we’ve got here like James McPake, Tim Clancy and Leigh Griffiths. I could go through the team. Cairney was a frustrated spectator as Hibs lost two early goals, Lee Novak and Sean Scannell capitalising as the home rearguard were guilty of ball-watching. There were encouraging signs up front, though, with Griffiths looking sharp and strong. His emphatic volley reduced the leeway and his magnificent cross-field pass helped set up Ivan Sproule for a superb second equaliser. The Northern Irishman cut inside Liam Ridehalgh before smashing the ball, left-footed, behind former Hibs goalkeeper Nick Colgan.